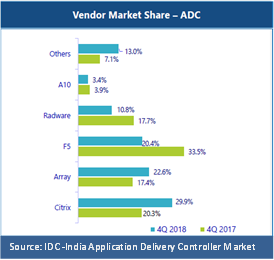 Array Networks has announced that it has secured the second position in the application delivery controller (ADC) market in India for Q42018. Compared to 4Q2017*, Array’s market share in ADC category has grown to 22.6% from 17.4% as per IDC’s Quarterly Ethernet Switch tracker, Q42018. The significant growth predominantly comes from its latest wins and closing deals in the government and large enterprise sector. In 2018, being part of India’s Smart Cities Mission has enabled Array Networks to generate over US$ 5 million in revenue. Array is currently involved in various stages of implementation for over 15 smart city projects across India. Additionally, Array will be part of 20 to 25 smart city projects this year. As per IDC’s Quarterly Ethernet Switch tracker, ADC market stood at US$ 35.7 million in CY 2018. In coming quarters, the government’s push towards digitalization and investment in public infrastructure, smart city initiatives and continual investment in network infrastructure, will be the growth factors that will influence the market in India. Array Networks Moves to Second Position in ADC Market in India 0 out of 5 based on 0 ratings. 0 user reviews.